A travel middle side bag perfect for either motorcycle (rear bag) or ATV (front/rear bag), made of 420D Nylon double-sided PVC Coating. 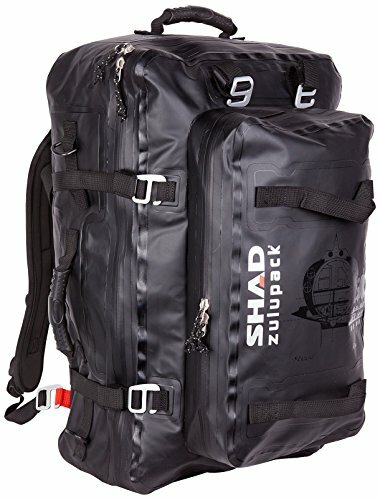 Waterproof Dry Duffle Bag offers a large zipped compartment of 45L, a medium front zipped compartment of 10L and a hanged inside pocket on the top. It also includes 4 compression side belts for 3 different compression areas and 2 belts to store stuffs on top of the front pocket. It can easily be carried thanks to the foamed shoulder straps, which can be hidden, and back cushioned with high density EVA foam, enhancing ergonomic when the bag is heavily loaded. If you have any questions about this product by SHAD, contact us by completing and submitting the form below. If you are looking for a specif part number, please include it with your message.